Those of you who follow me on Twitter or listen to my audio blogs know that I often try to share snippets of my piano playing with the world. Learning piano can be a tricky proposition. 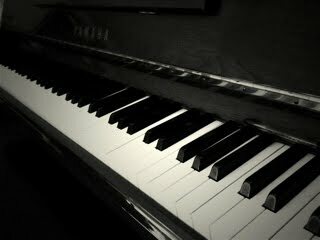 Most people I know (young adults) live in apartments or condos, so even owning a piano or keyboard is a challenge. Then you have to find a teacher who is personable, talented, and skilled at instruction, not to mention easily accessible. The entire process can be extremely daunting. My mother was a classically trained musician and taught my brother and me when we were little. When high school and college happened, I lost touch with my piano skills. But these past few years, I’ve tried to take it up again, putting in a little bit of practice using various styles every day. Practicing piano every day is already a challenge, but finding the time to schlep out to piano teacher and fork over $50-100 on a weekly basis made the entire process considerably less appealing to me. I tried using how-to books, but while they can teach you some good blues licks, there’s only so far they can take you before the book simply ends. I wondered if there was an online solution for this. That’s when I found Willie Myette. Myette hosts a series of piano lessons at pianowithwillie.com. His lessons appeared to be extensive, and covered both general styles and specific songs. But was his program any good? And was it worth the money that he charged? What follows are my thoughts on learning piano online with Myette. You can sign up to have access to a specific lesson or a specific genre’s worth of lessons. With the Gold Complete membership, you are given access to the entire site. Myette’s genres include Jazz, Gospel, Funk, Latin, Blues. 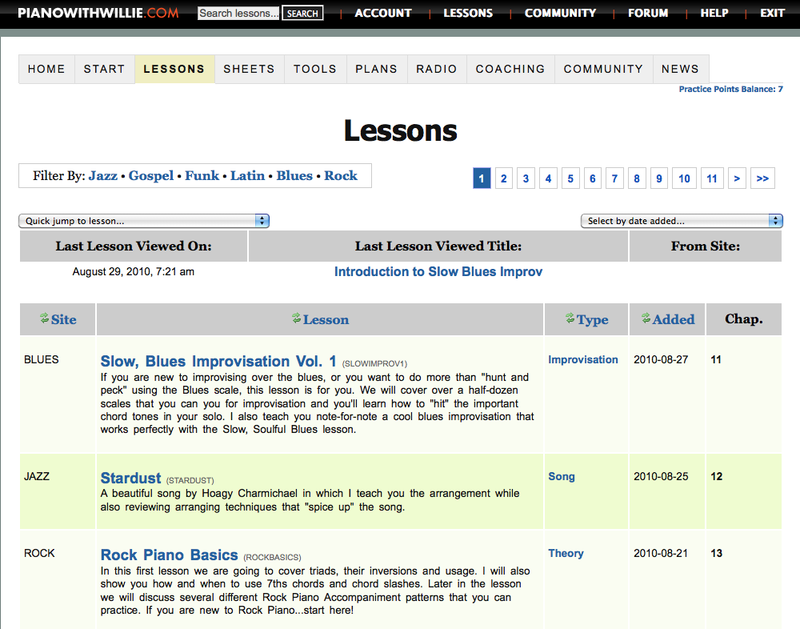 Once you’ve chosen a genre, you are given a choice of which lesson you want, sortable by upload date and “type” (e.g. Theory, Improvisation, etc.). Unfortunately, there is no ability to easily sort all lessons by difficulty level. 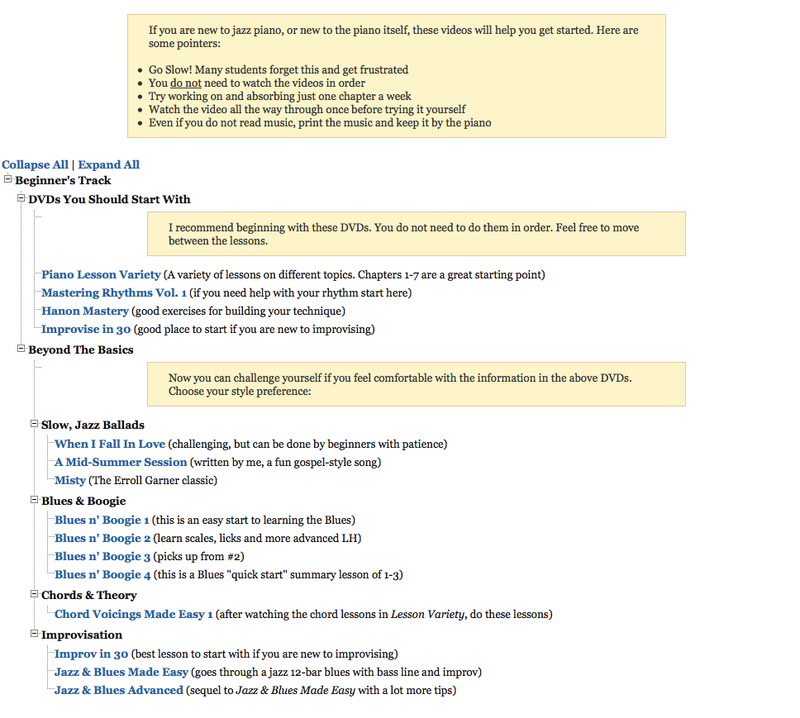 The video of the lesson appears on the left, while the several “phases” of the lesson appear on the right side in clickable list form. This is an extremely clear and convenient layout to use. You can progress through all the parts of the lessons in one go, or view them one at a time depending on how much time you have. At no point did I feel confused about how Myette was taking me through these lessons. There are a couple of other benefits that this interface offers. 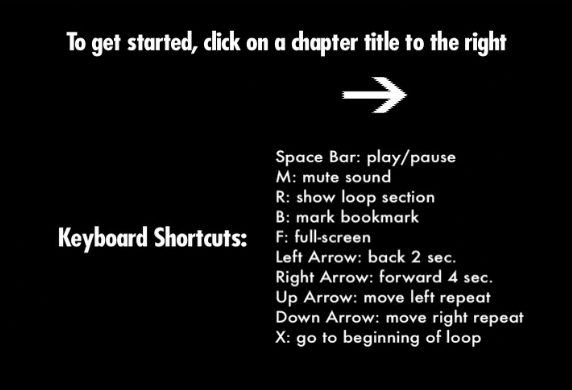 First of all, video is easily navigable, via keyboard shortcuts. These actually come in handy a lot more than I’d originally suspected, given that Myette can often demonstrate something that you’ll want to look at again more closely. Having keyboard shortcuts greatly aids this process. In addition, Myette provides downloadable sheet music that supplements the lessons (mostly in PDF format). These can easily be printed out and serve as helpful references in the form of specific licks or lead sheets for whichever song you are learning. My one complaint with the site’s interface is that occasionally, getting to the actual lesson can be a bit tricky. Overall, the interface feels really busy, with countless options to choose, only a few of which will actually lead to something that I’m actually interested in (i.e. the lessons). It feels like it could be simplified dramatically without impacting the user experience. For example, the top of the site has a “pianowithwillie” overlay bar, but also a separate menu bar underneath that duplicates some of the features of the top bar. Another potential issue with the site is that physically viewing these lessons can sometimes be a practical challenge. I found that the optimal situation was using a small netbook/laptop positioned on top or near my piano. The only alternative would be run back and forth between your desktop computer and your piano, which would not make for a great music-learning experience. These lessons would have been absolutely perfect for something like the iPhone, iPad, or another portable device. Unfortunately, many of the older videos are all in flash, so they don’t work on those devices. [Myette does allow you to download one lesson per day as an FLV, mp3, or even M4v sometimes (these lessons are not banked, so you can’t save them up), so it is theoretically possible to transcode them for iPhone use, but this would be an intensely cumbersome process.] I’m not sure what encoding Myette is using for his newer videos but it’s worth pointing out that most of the lessons created within the past year work on an iPad, iPhone, or iPod Touch. This greatly improves the site’s ease-of-use. Overall, though, it’s impressive what Myette has been able to do with the interface. It is easy to use, easy to navigate, and demonstrates that a great deal of thought was put into it. The first thing I noticed about the site’s content is its volume. Myette has been doing this for years, studiously uploading lessons regularly for most of that time. There are easily enough lessons on this site to last a student for years. Myette’s lessons across all genres can be divided into two broad categories: individual songs and general skills (including theory). Many of his individual song lessons take you through the entire process necessary to master that song. By necessity, they will occasionally repeat some information, or leave some information out, relegating them to other, more skill-oriented lessons. It’s worth noting that Myette also offers lessons plans for beginning, intermediate, and advanced users. The plans offer a fairly detailed track for making the most out of your time on the website, and they can be useful for those who are trying to figure out how to make their way through the vast amounts of content on the site. The only shortcoming I can see with Myette’s lessons is that I believe you will get the most out of the lessons if you already possess a basic understanding of piano fundamentals. In other words, I think Myette’s lessons are okay for beginners, great for intermediate learners (which I would describe myself as), and probably even better for advanced learners. Myette goes very quickly and many of his intermediate/advanced lessons (i.e. the bulk of all lessons he’s uploaded) will assume a significant amount of piano knowledge. That being said, it’s probably still possible to pick things up from a beginner’s starting point; you’ll just need to work much harder on building up the fundamentals. It is a tricky thing, to teach someone from across the internet who you’ve never met. So much of the modern music lessons requires on that indefinable give-and-take between teacher and student, on adaptability, on the recognition of the idiosyncrasies and nuances of each individual. So how does Myette fare as a music teacher? Pretty damn well, I’d say. Myette’s teaching style is both likable and easy-to-understand. Having worked with several piano teachers in my life, I found Myette to be just as good as any of them, if not better. Myette seems to implicitly exactly what it is that students might want. His lessons offer a way both to re-create a piece exactly as he’s played it, and to figure out how to make your own voicings and improvisations. It’s difficult to account for the vast range of needs that virtual students might have, but I think Myette does so wonderfully. In other words, I’d have no problems paying Myette for actual lessons in-person. And that’s a good sign for someone you’re going to take virtual lessons from. If you have any doubts, just take a look at the “mini-lessons” that Myette has already posted up on Youtube. He really wants you to know what you’re getting when you sign up for the site. First of all, many of Myette’s individual lessons are available in DVD form, which can be convenient if all you want is to learn how to play one song. The DVDs are priced at $40 each, which sounds high until you consider that this is the low end of what a normal piano lesson costs. Myette has divided his site into five categories: Jazz, Gospel, Funk, Latin, Blues. You can subscribe to each one of these sections for $29/each/month, or pay $299 for an entire year’s worth of access. The Gold membership, which strikes me as by far the best deal, provides you with access across all lessons/genres on the site for $399/year. Again, regular piano lessons in the real world can cost up to $100 per hour. Given these prices, you can either pay for a few real life lessons with a local teacher, or get one full year’s worth of dozens of lessons with Willie Myette. In terms of value, Myette certainly takes the prize here. My only beef with the pricing is that the different sections offer vastly differing amounts of content. 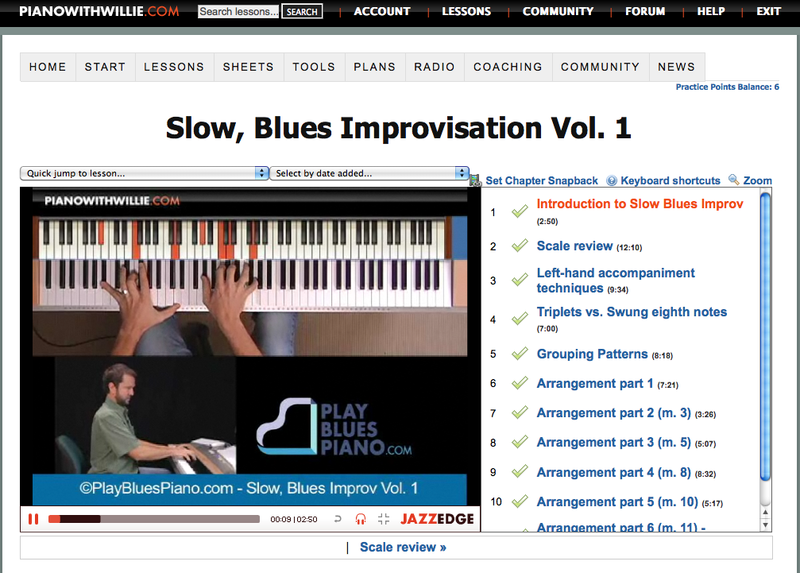 Jazz piano lessons is by far the most rich, while Myette only started the Blues section recently. But what makes it a viable option nonetheless is that Myette is constantly adding lessons to these sections and responding to feedback. Thus, the Jazz membership is probably the best value, but if you’re going to spend hundreds of dollars anyway, I’d go with the Gold. There are a few other site features that are worth pointing out. First of all, Myette used to host a once-a-month 30-minute long show that went over a lot of the concepts he discusses in his lessons. These are all now available in mp3 format on the site, and themselves constitute dozens of hours of potential learning material. Second of all, Myette is actively involved with the site on an ongoing basis. He solicits feedback, asks for suggestions for lessons, and then acts upon those suggestions. The site offers a forum and while it’s not the most thriving community I’ve seen on a website, Myette is active on it. For a site that you’re forking over hundreds of bucks a year to be a part of, his presence is a reassuring one.